What can be done about corrosion? There are several accepted methods for controlling this problem. These include neutralizing filters, polyphosphates, silicates, oxygen scavengers and coatings. Each has a record of some success in minimizing the corrosive action of both hard and soft waters. 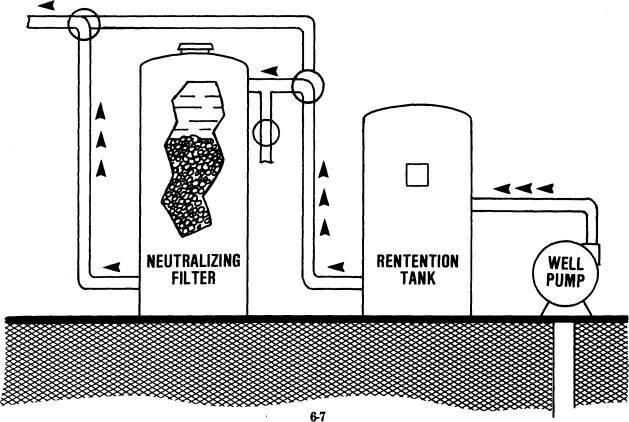 Tanks containing limestone chips (calcite) bring results by eliminating acid conditions due to carbon dioxide or small amounts of mineral acids. In this treatment, the acid combines with the carbonates in the limestone to form relatively inoffensive bicarbonates. Limestone filters are easy to use. They require little care. The homeowner need only add more limestone chips occasionally. Neutralizing the acid may cause an unstable condition to develop, so that scale will form quite easily. If there is much acid content, the filtering operation may so unbalance the water that a softener will be needed to remove the hardness. Removal of an acid condition may intensify iron problems. 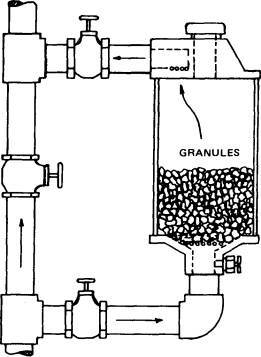 If the water is iron­bearing, use of a limestone filter may precipitate any ferric iron either in or beyond the filter, and thus intensify staining problems. Iron may also clog the filter so that more frequent backwashing becomes necessary. Polyphosphates are a group of chemical compounds which react with small quantities of hardness to form a thin, tight film on pipe walls. This film is almost like glass coating. These films or coatings keep water away from the metals and in this way control corrosion. Polyphosphates are effective in controlling corrosion of most metals used in household plumbing. Copper and its alloys are the one exception at present. This action is being given further study. Polyphosphate films are not permanent. They will dissolve over a period of time. To combat this it is necessary to feed polyphosphates into the water more or less continuously. For best results, use 5 to 10 ppm of polyphosphates in cold water; 5 to 20 ppm in hot water. This dosage will generally give adequate protection against corrosion. Injection by means of a chemical feed pump. Use of specially prepared compounds in a small tank. Polyphosphates are combined with calcium and magnesium during their manufacture. When placed in a small mixing tank, these compounds dissolve slowly. If some of the water is directed through the tank, it will absorb polyphosphates needed in the system. These compounds can be fed into water by we, of a pot feeder. The weakness of this second method is in its inability to produce an even concentration of polyphosphates. To correct this problem, the use of a mixing tank to even out the highs and lows of feed is advisable. Further, the general practice is to feed a somewhat higher concentration than the required 5 to 20 ppm to compensate for incomplete mixing. When solid polyphosphates are used for treatment of corrosion, it is considered advisable to use a dissolving tank like the one above. Municipalities and industrial firms sometimes feed sodium silicate into partially softened water to reduce corrosive tendencies. Like polyphosphates, silicate forms a protective film. In some cases caustic soda is also added to raise the pH as an aid in arresting corrosion. Sodium silicate is used exclusively for municipal and industrial control of corrosion. Household use of the product is not recommended due to the extreme care necessary in its feed. There are disadvantages to the use of silicates. It is difficult to find a silicate that dissolves at the right rate, neither too slow nor too fast. Further, as changes of water temperature occur, protective silica films do not remain fixed to the container walls. Oxygen scavengers are another industrial approach to the corrosion problem through the use of chemicals. Sodium sulfite and sodium nitrite have long been used as oxygen scavengers. Some corrosion experts hold that dissolved oxygen is the primary cause of corrosion. If so, one might well expect that oxygen scavengers can control corrosion at all temperatures. And they have produced results justifying their long use. Further, oxygen scavengers provide an inexpensive method for controlling corrosion. Unfortunately, they may render a water impotable. For this reason they can be used only for certain industrial purposes. it tends to "heal" breaks in the coating. Thus, if the zinc coating is damaged by either mechanical or corrosive action, nearby zinc goes into solution, and then deposits as zinc oxide on the exposed form a new protective coating. In this case, "galvanic action" is used to protect the steel. Other coatings are also widely used. Among these are "glass" linings, paints and other organic coatings. All have proved helpful more or less. The major problem with coatings is the difficulty of applying continuous cover. It is hard to coat a metal surface without leaving "holidays" or bare spots. Unfortunately such breaks in the coating may serve to intensify corrosive action. Even a tiny pinhole may cause trouble. In a glasslined container, for example, a pinhole may enable corrosion to spread like a cancer under the glass coating. Coating techniques have made remarkable strides in recent years. Glass lining is now so reliable, for example, that manufacturers guarantee water heaters for ten or even 15 years. While these results are excellent, the practice is generally limited to the interiors of tanks and large vessels. Except in rare instances, it is too costly to coat long lengths of small pipe in the same manner. Where dissimilar metals must be connected in a water system, the use of nonconductive fittings significantly reduces galvanic corrosion. These nonconductive fittings break the connection between the dissimilar metals. This sharply reduces the flow of current between the metals. The result is almost complete stoppage of electrochemical corrosion across the joint. Insulating bushings work well where the connections involve relatively large surface areas. The inlet and outlet of water heaters are good examples. The use of such bushings may not be practical at every valve location in a system, however. This handicap is especially a factor in the case of small joints. So, what percentage of success can be expected from use of these techniques? The answer must be: "It depends . . . " This answer is due to the fact that corrosion has various causes. Further, the problem can be aggravated by other conditions. All have an effect on the possible success of available treatments. The choice of treatment in each instance depends on careful attention to the corrosion factor plus other problems present.